Allow me to present to you to a type of music that has a special place in my heart: the Nasib, or “Song of Fate” from Indonesia and Malaysia…part of what once was the Dutch East Indies. ‘Nasib’ in Malay means ‘fate.’ The Nasib song is an aching, slow lament; a deeply melancholic popular song type which is built around the singer’s misfortune in life. On the surface, this description would make the Nasib similar to the fado, rebetika, or blues, but that would be a mischaraterization. The origins of the Nasib derive, in fact, from Indonesian/Malaysian stambul theater music. Stambul theater (also referred to as bangsawan) developed in the late 19th century and was an urban affair, where theatrical groups would perform musical dramas, many with stories which had origins in India or the Middle East. Stambul songs were most popular from 1920-1935. The Nasib is sung by a singer who is in fact playing – or at the very least channeling – a character or situation from these classical stories, rather than singing her own blues. Interestingly, much of the stambul music that I’ve heard from that era is quite cultured – operatic, even. However, the Nasibs, although derived from stambul, are a different thing altogether. The operatic aspect has gone out the window, and what we have here is swooning sadness – the Nasib adopted to a bar band setting! 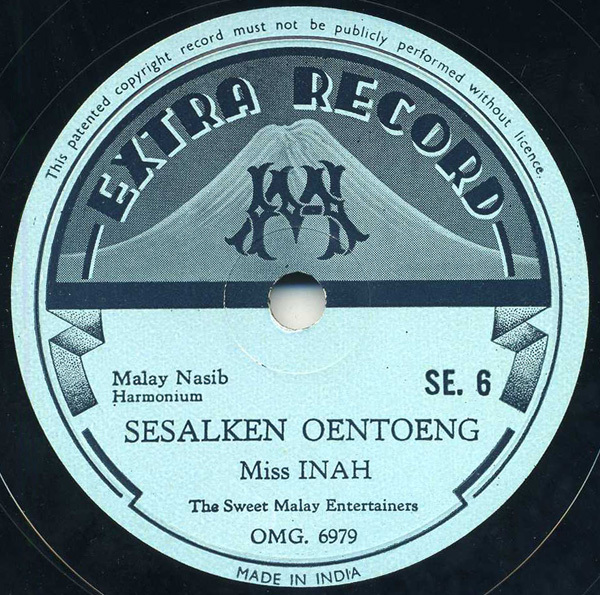 Today’s Nasib features Miss Inah singing “Sesalken Oentoeng” (a Dutch transliteration of the Malay “Sesalkan Untung”), which more or less means “I Regret My Luck.” She is accompanied by her smooth yet lurching Malay Entertainers on harmonium (another Indian connection), saxophone, bass, and percussion. Miss Inah & The Sweet Malay Entertainers - "Sesalken Oentoeng"
I thought I’d update mid-week with a pretty solid example of mid-20th century Indonesian krontjong. Krontjong (in relatively equal amounts spelled kronjong, kroncong, keroncong, and kerontjong) is slightly over a century old, and is an urban folk music. Ethnomusicologists would call it a syncretic music, as it developed over time from a variety of cultural influences, such as Portuguese, Batavian, African, and Malay – all of which were present in one form or another in turn of the century Indonesia. Known for its languid rhythm, Hawaiian “walking guitar,” and partially improvised violin runs, the style was first recorded in 1904, but musically hit its stride and popularity in the 1930s. 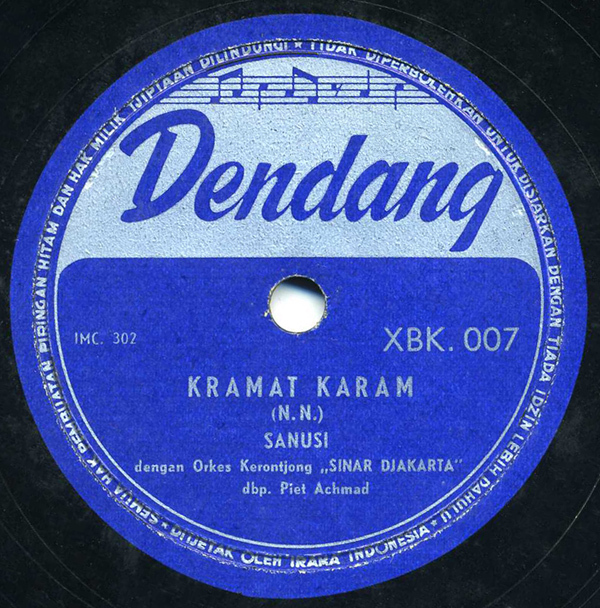 By the 1940s, independent Indonesian labels began to appear such as Dendang (pictured here), Irama, and Serimpi, and hundreds if not thousands more krontjong records were released, joining the large amount already available from HMV, Odeon, and other companies. In my personal experience, I’ve found it difficult to track down much krontjong on 78 outside of Indonesia, nor has much, if any, early krontjong music been re-released on CD. I’ve always found it unique – it often sounds like two bands playing completely separate arrangements of the same song, and somehow landing on their feet. Rizeli Sadık - "Erkek Kadın Oyun Havası"
hi thanks for be friend. i like your post!